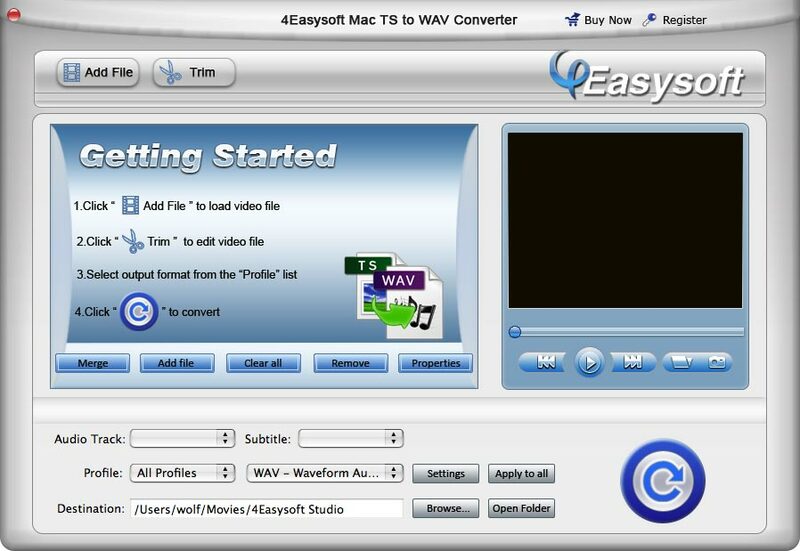 4Easysoft Mac TS to WAV Converter is versatile and practical Mac TS to WAV software which allows you to convert TS to WAV on Mac and convert other video and audio formats to WAV, MP3, MP2, OGG with just a few clicks. Some of the compatible inputting formats include MPEG, MP4, TS, WMV, AVI, 3GP, HD TS, HD MP4, HD WMV, MP3, MP2, AAC, WAV, WMA, M4A. No matter you are a veteran or beginner, you can customize output audio settings of Encoder, Channels, Bitrate and Sample Rate according to your personal need at will. Best of all, if you want to trim TS videos to small size or want to merge your favorite TS clips or add your favorite watermark before converting, 4Easysoft Mac TS to WAV Converter is your first choice as well. Convert HD TS, HD MTS, HD M2TS, HD MP4, HD H.264, HD RM to WAV, MP3, MP2, OGG. Convert MP3, MP2, AAC, AC3, WAV, WMA, M4A, RM, RAM, OGG, AU, AIF, AIFF, APE, FLAC, NUT to WAV, MP3, MP2, OGG on Mac. 4Easysoft Mac TS to WAV Converter allows you to trim videos at will. Just set start time and end time during which you like the contents, then click "Ok", it will convert automatically. TS to WMA Converter for Mac allows you to adjust audio bit rate, audio channel, sample rate and let you select an audio encoder. You can customize the settings and save them as your own profile. So you can use the customized profile next time by selecting it from the list. Join several favorite clips into a long successive one to double your enjoyment. It is possible to add watermark in the form of text or picture as you like. Choose subtitle and audio track or none of them for your output file with this 4Easysoft Mac TS to WAV Converter. You can preview the input and output files in the preview window to check if the files loaded correctly. TS WAV Converter Mac allows you to have a better control of the edited effects while previewing. Click Snapshot, the current picture in the preview window will be captured and saved in the specified folder in the image type as you have set – GIF, JPG or BMP. Provide >400% converting speed, so fast beyond your imagination and automatically shut down your PC after conversion. 4Easysoft Mac TS to WAV Converter adopted advanced audio and video sync technology, which helps to output audio with high quality, never let you be troubled by the audio issues. Personalize your presentation video by adding watermark. Add the ability to output one file to different formats at the same time.